During a recent trip to the Mokohinau Islands I, and everyone else on the boat, were left gob smacked by a fishing system Paul pulled out of his tackle box. Despite the fact that five experienced fishers were on the boat, Paul caught over half the fish taken on the trip. I was amazed to see two huge john dory in a row taken on dead baits on this system, everyone knows john dory don't eat dead baits! Paul fished his system over mud, deep reef (over 100 metres), among black coral and also over shallower 20-40 metre kelp covered reef. This rig did not snag once. Not only was this system brilliant on snapper and john dory, it also caught trevally, terakihi, grandfather hapuka and red snapper. In the south I think this would be one of the better cod fishing rigs to use over reef and foul ground. I think a lot of the reason behind Paul's success was that this rig took almost no time at all for him to set up, he also lost no time to tangles with other fishers on the boat despite all the rest of us losing a considerable amount of valuable fishing time undoing the kind of tangles charter boat operators dread. It was so frustrating. The tangled gear would be hauled up yet Paul's sinker always remained on the bottom and his mainline unaffected. The only part of Paul's gear involved in any tangles was the clip-on running trace. (The trace can slide all the way up to the rod tip) I can't count how many times I wound up pulling up his trace, and often his fish as well. All Paul had to do was unclip his running trace and attach another one already pre-baited and ready to fire straight back down again. I on the other hand fluffed around undoing knots, taking off fish, winding in sinkers, etc. etc. and finally only getting my gear back in the water after a lot of wasted fishing time and colourful language. The top right hand insert of the diagram shows how the rod is prepared to deploy the sliding trace rig. A quarter ounce sinker is put on the line first, followed by a plastic bead. (Paul used a luminous bead). The bead protects the knot on the swivel. The swivel prevents the weight, and the bead, from falling off. The one metre long traces are pre-tied with a longline running clip and swivel. (from the swivel on the rod to the swivel that holds the bottom weight). The drop line should be weaker than the mainline on your rod in case the bottom weight snags. The drop lines are tied in different lengths for different bottom types. Paul used a 3 metre drop line over the black coral and a 2 metre drop line over the kelp. All of Paul's traces and drop lines were stored on a rack to keep the traces free of kinks. If you don't have a decent trace rack, then it's easy enough to make a temporary one using a piece of wood and a few nails. (See bottom left insert on diagram) The only other item required is a variety of clip on weights ranging from 2 ounces to 8 ounces. When you arrive at your fishing spot clip a drop line onto the swivel on the rod. This will allow your trace to be deployed above the foul, coral or kelp. Lesser foul requires shorter drop lines. Then clip the bottom weight to the end of the line. The baited trace can be clipped under the quarter ounce sinker at any time while the main weight is sinking, or even after it has reached the bottom, as long as the small sinker is kept in your hand. When released the trace drifts downwards slowly regardless of how fast the the main sinker is falling and the hook keeps away from the rod line and streaming clear in the current. Effectively the trace trolls slowly from the surface all the way to the bottom. (That's how Paul managed to fool the two john dory) Paul believes in stronger rip conditions the small top sinker may be unnecessary. This system is a boon to all those fishers who spend half their time rigging the kids gear before they can wet their own line. It's one of the best bottom rigs fishing charter boats can use to minimise the risk of tangles. 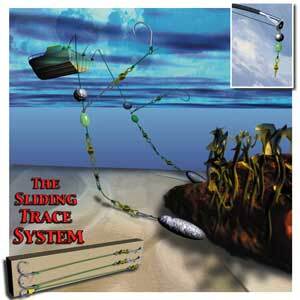 Using the sliding trace system allows all the setting up to be done at home. The savings in reduced down time untangling gear will ensure all your fishing time is as pleasant and productive as possible. If the fish are hard on a sand or mud bottom just clip the trace on to the swivel under the bead and you have a conventional running sinker bottom rig. If the weight is too light simply clip a running sinker on the rod line and let it go, no need to haul the line up to add weight!